A new blade holder for the Prepzilla MILLHOG® pipe beveling tool that permits beveling, facing, and boring simultaneously to assure high weld quality is being introduced by ESCO Tool of Holliston, Massachusetts. The Prepzilla MILLHOG® I.D. Clamping pipe beveling tool machines pipes from 1.5” I.D. to 8.625” O.D. using only eight sets of clamps and one mandrel. Featuring a new, rigid three-blade holder designed to bevel, face, and bore in one operation, this end prep tool assures there is a smooth transfer when matching two different pipe schedules for optimum weld quality. Suitable for highly alloyed materials, the Prepzilla MILLHOG® I.D. 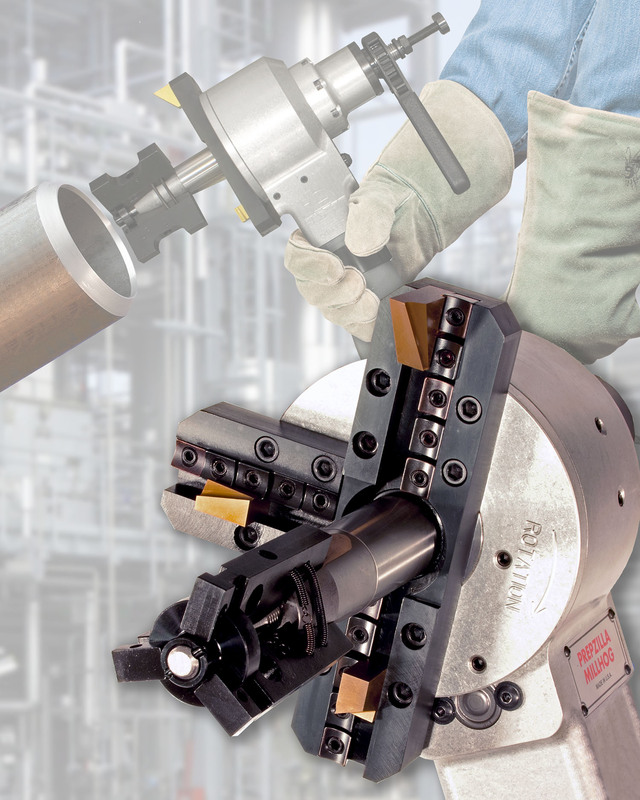 Clamping pipe beveling tool can produce end preps at any angle without cutting oils. It has robust construction with dual-opposed tapered roller bearings, direct drive gears, a rigid blade lock system, and TiN coated T-15 tool steel cutter blades. Air- and electric-powered models are available. The Prepzilla MILLHOG® I.D. Clamping pipe beveling tool featuring a three-blade holder is priced at $8,995.00 and is available for rent.